1492 marks an important moment in world history, not just because it’s the year Columbus landed in the Caribbean, along with smallpox, mercantilism, and other European diseases. It is also an important year in Spanish, Ottoman, and Jewish history. 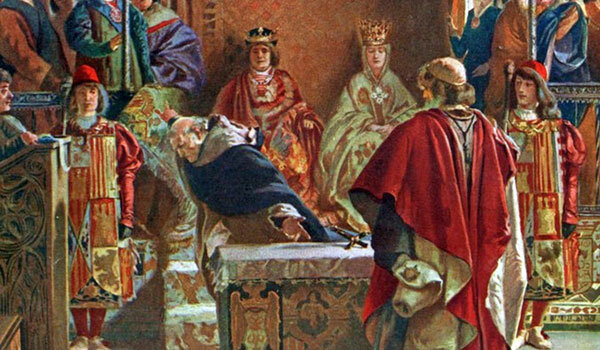 As European powers were slowly consolidating into modern nation-states, King Ferdinand and Queen Isabella of Spain passed a decree, the Alhambra Decree of 1492, that required all Jews to be expelled from Spain, or else convert to Christianity. This pattern of expulsion began with the centuries-long Reconquista, ending with the 1491 fall of the Emirate of Granada. The Spanish monarchs wanted not just a larger nation-state, but a religiously pure one. Thus, they expelled any Jew who refused to convert. Many crossed the border into Portugal; a few years later, the Portuguese crown declared the same policy, but directed its efforts at forced conversion rather than expulsion. The Spanish Inquisition played a crucial role in these events, as well. Thousands of Jewish and Muslim refugees were left without a home as a result. The next month, after hearing about the expulsion, the Ottoman Sultan Bayezid II, issued decrees of his own allowing any and all Jewish refugees to resettle in Ottoman territories. He sent the massive Ottoman navy to Spain, under the famous admiral Kemal Reis, to help Jews, as well as Muslims, flee religious persecution in the Iberian Peninsula, known as Al-Andalus to the Ottomans. The refugees settled throughout the Ottoman Empire, often in large urban centers such as Cairo, Jerusalem, and Damascus. Today, Sephardic Jewish communities still hold a presence in Turkey. The Ottoman Empire was at its height in the fifteenth and sixteenth centuries. It enjoyed economic influence over its surrounding polities, had a strong military, and was known for its extreme religious tolerance. A diverse empire to begin with, encompassing Turks, Arabs, Greeks, Kurds, and Armenians, the Sultanate practiced tolerance for all religious traditions inside the empire, including Sunni and Shi’i Islam, Eastern Orthodox Christianity, long-standing Judaism, and at its edge Catholic and later Protestant Christianity. In many ways, the Ottoman Sultan was the leader of the free world at the time. I’ve never believed history repeats itself. I don’t want history to repeat itself. It’s often hideous and unfair. But maybe the western world should take a lesson from the Ottoman Empire and open its borders to Syrian and Iraqi refugees fleeing many of the same places Europe’s refugees resettled in the 1490s. Maybe this is one of the few moments in history that should be repeated. European nations cannot reverse the policies of Assad and ISIS, just as the Ottoman Sultan could not reverse the equally barbarous policies of King Ferdinand (yes, ISIS and the Spanish Monarchy are equally evil). But Europe and the U.S., as much as the Ottomans, can commit to an act of compassion in the face of unmitigated brutality. After all, it’s clearly been done before. Lapidus, Ira. A History of Islamic Societies. New York: Cambridge University Press, 2002. This entry was posted in History and tagged 1492, Al-Andalus, Damascus, European history, Historiography, History, Islamic World, Jewish history, Kemal Reis, Ottoman Empire, Ottomans, Portugal, refugees, Spain, Spanish Inquisition, Sultanate, Turkey on September 8, 2015 by keeneshort.